The legendary GEL-Kayano series celebrates its 20th anniversary in style with one of the best updates to both upper and midsole. The party gets began with new FluidFit upper and FluidRide midsole, creating an unsurpassed fit and ride that helps to keep the GEL-Kayano 20 ahead of its time. ASICS FluidFit upper technology combines multi-directional stretch mesh with stretch reinforcements that adapt to the athlete’s foot, creating a actually customized glove-like fit. This evolution of DuoMax system enhances stability and Give a boost to, with reduced weight and increased platform Give a boost to. Exoskeletal heel counter provides improved Give a boost to and creates improved heel fitting environment. This Trusstic System integrates Guidance Line construction for enhanced gait efficiency at the same time as providing midfoot structural integrity. Attenuates shock throughout affect and toe-off phases, and allows movement in a couple of planes as the foot transitions through the gait cycle. 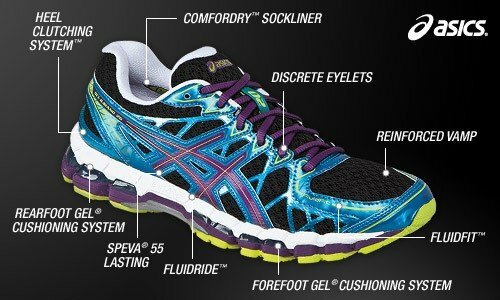 The recent evolution in ASICS midsole technology, FluidRide provides the ultimate combination of bounce back and cushioning properties with reduced weight and exceptional durability.